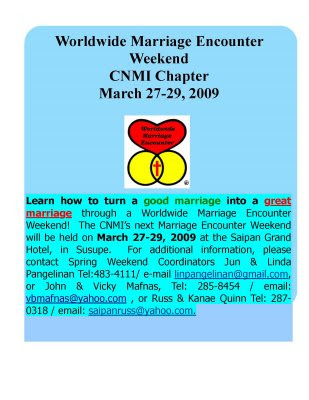 CNMI Marriage Encounter: March 27-29, 2009 ~ the Next M.E. Weekend! March 27-29, 2009 ~ the Next M.E. Weekend! This morning, Vince & Hilma Castro and Russ & Kanae Quinn appeared on the Harry Blalock Morning Radio Show on KZMI 103.9 FM to invite listeners to register for the weekend. All married couples in the CNMI are eligible to attend. The Weekend allows couples to spend time together, focusing on communication in their marriage. The cost is only $50 per couple for a 2 night stay and covers all meals on Saturday and Sunday at the Saipan Grand Hotel. For those who wish to attend but are unable to fund the $50, sponsors are available. Please contact Hilma & Vince Castro. Hilma:789-7881 and Vince: 287-8089. Email: hilmacastrome@gmail.com. Spring Marriage Encounter Weekend Starts Tonight!